On the third anniversary of conflict, let us stand #WithSyria Film narrated by Idris Elba with exclusive music from Elbow. #WithSyria is a coalition of over 130 humanitarian and human rights groups calling for this to be the last anniversary of conflict in Syria. This animation explains the origins and ramifications of the Syrian conflict. It aims to be a starting point for a deeper exploration of the topic, providing background and context to audiences that haven’t followed the conflict closely. In March of 2011 thousands took to the streets all over Syria to demand reforms, following the example of popular uprisings in Tunisia, Egypt and Yemen. The government of Bashar Al-Assad responded with force, triggering a civil war that has claimed the lives of over 60.000 Syrians in the last two years and brought misery to both sides of the conflict. 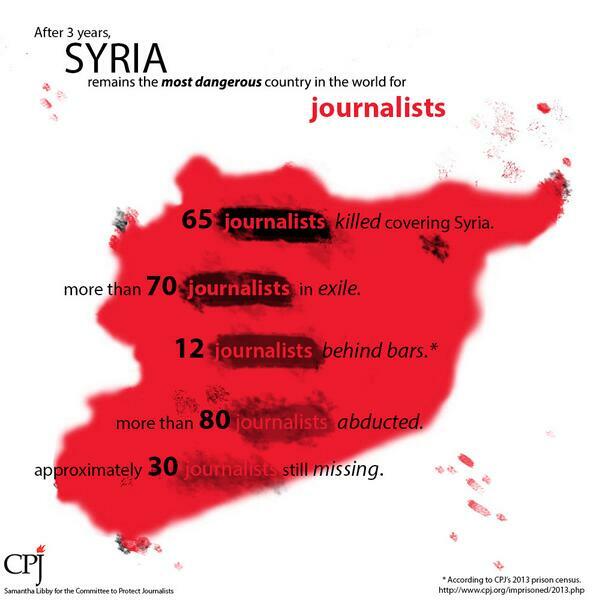 Without question, Syria has become the bloodiest chapter in the Arab Spring. Today marks the three year anniversary of the Syrian uprising, which later devolved into a civil war that continues today. According to a UNHCR report released this week, Syria’s internal conflict has resulted in over 140,000 deaths, over 2.5 million refugees fleeing to neighboring states, and more than 9 million of its people uprooted from their homes, making Syria the world’s leading country of forced displacement. After Kofi Annan’s unsuccessful peace plan in 2012 and a handful of inconclusive peace conferences since, Syria remains in a bloody stalemate between government forces and rebel factions. As the Arab Spring spread like wildfire across the Middle East, Syria’s uprising began with a peaceful “Day of Rage” protests in the southern city of Deraa on March 15, 2011, but devolved to armed conflict after a harsh crackdown by security troops ordered by Syrian President Bashar al Assad. This triggered nationwide protests involving hundreds of thousands of citizens by July 2011. In December 2011, military defectors and Syrian protestors formed the Free Syrian Army, with the purpose of toppling the Assad regime. The country approached civil war as rebels took up arms to defend themselves and expel government forces. The capital Damascus, Aleppo, and historic Homs have seen the bloodiest fighting and fiercest destruction. The Free Syrian Army remains the primary Western-backed rebel force; however, several competing rebel factions emerged on the battlefield, including jihadist groups affiliated with al Qaeda. Syria’s civil war enters its fourth year this week having claimed more than 100,000 lives and displaced millions both within Syria and abroad. The fighting, which began with popular protests against President Bashar al-Assad’s authoritarian rule started in early 2011, as part of the wider North African and Middle Eastern protest movements that came to be collectively known as the Arab Spring. March 15, 2011. In Daraa, a city near Syria’s southern border with Jordan, a group of students inspired by protests in Egypt and Tunisia wrote “the people want to overthrow the regime”, on a school wall. The children were arrested, detained and tortured; locals gathered peacefully to march through the city and demand the children’s release as well as call for democracy, political freedom and an end to corruption. The protests continued and security forces opened fire, killing four demonstrators. The government said the protesters “had caused chaos and riots”. Protests began to spread to Damascus, Homs and Baniyas, where the police again responded with force. Dozens of protesters were arrested. March 25, 2011. At least 100,000 Syrians attend an anti-government demonstration. They burn a picture of Bashar al-Assad and topple a statue of his father, former president Hafez al-Assad. Gunmen start firing at the crowd. At least 20 were killed. The government then launched a full-scale siege on Daraa and other towns. Mass arrests began and tales of torture spread across the country. The protest movement grew. Protesters called for basic reforms; a multi-party political system, a democratic country. The regime introduced some limited reforms but the protesters demanded Assad, who had been in power since 2000, step down and allow a democratic election to take place. Summer 2011. The violence continued and the Free Syrian Army was formed with the aim of overthrowing Assad’s regime. The number of people killed rapidly rose – around 2,000 people had been killed since March. Ban Ki-moon, the UN secretary general, has described the conflict in Syria as “the biggest humanitarian and peace and security crisis facing the world, with violence reaching unthinkable levels”. The UN says 40 percent of Syria’s population is in need of humanitarian aid, and at least 140,000 people have been killed. A military resolution to the conflict is seen as unlikely in the near future, if at all; and diplomatic efforts to resolve the crisis appear to have stalled. On Inside Syria we ask: Where does hope lie for an end to the fighting? LINK TO VIDEO: Syria’s conflict: Three years on – Inside Syria – Al Jazeera English. In 2011, the now three-years-old conflict in Syria began as a peaceful protest for human dignity and political reform. While citizens were inspired by the uprisings in Tunisia, Egypt and Bahrain, Bashar al-Assad’s regime drew its lessons from these events and decided, very much from the outset, on what it called a “security solution” (al-hal al-amni), i.e. the brutal repression of any popular protest by military force. The regime’s reaction – in turn – triggered defections from the armed forces and a militarisation of the uprising. From mid-2011, the conflict evolved into a civil war, a bloody struggle for power in Syria, which increasingly became overlaid with a regional struggle for Syria. Whoever wanted to stop the fighting in Syria needs to understand its nature. The war increased the confessional polarisation in Syria and the region. It is not, however, a confessional war. It has a strong international dimension, but the United States, the European Union, and even Russia regard it as an unsavoury regional problem, into which they don’t want to be dragged , rather than an international conflict. Regional powers clearly pursue their own geopolitical agenda by supporting either the regime or oppositional groups. The Syrian war is not a regional proxy war. Al-Assad and his entourage are not fighting for Iran, but for their own power. Most regime loyalists are not even fighting for al-Assad and his family, but feel forced to defend the existing regime out of pure fear for their own physical survival. In the last three years, the Syrian civil war has claimed tens of thousands of lives and uprooted millions. Dr. Charles Cogan, an associate with the Belfer Center’s International Security Program, discusses the international community’s attempts to end the hostilities, defends President Obama’s decision not to use military force to intervene, and weighs in on how the crisis in Ukraine may affect what happens next. Summary Executions of Civilians by Syrian Rebels? Who is winning the Syrian war?